When I was seventeen I spent a summer in Spain, mostly Madrid. My mother had signed me up for an educational vacation, and about 45 of us from all over the country found ourselves housed in dorm rooms at the University of Madrid. Our teacher was a Spanish college student not much older than us, and we became fast friends. She wanted to practice her English, which made it hard for us to learn Spanish (the reason we were there); we wanted to shop, sit by a pool, and look at boys. Many of the locals had left for the coast or were out of the country because it was hot and humid, so the streets were pretty empty during the day. But when the sun set, the sidewalks would suddenly fill with people. That was our cue to head to our favorite spot, an old stucco building with white walls 3 or 4 feet thick. The whole place was huge, but at first we didn’t realize it because the main room was so small. We followed the sound of music down a long hallway with many twists and turns leading to other rooms with small bars. Continuing down some stairs to a basement, we found a Flamenco guitarist playing. Sometimes there were amazing dancers too. Occasionally the dancers were men, but they were so serious that I preferred to watch the women who were passionate as they twisted their ruffled skirts and tossed their heads from side to side, long hair flying as they danced. The guitarist would begin the song very slowly and the dancer would tap her shoes in time. Gradually the guitar would get louder and faster and the dancer would too, clapping her hands and snapping her fingers. I was completely mesmerized. The suburbs of Boston became a distant world. 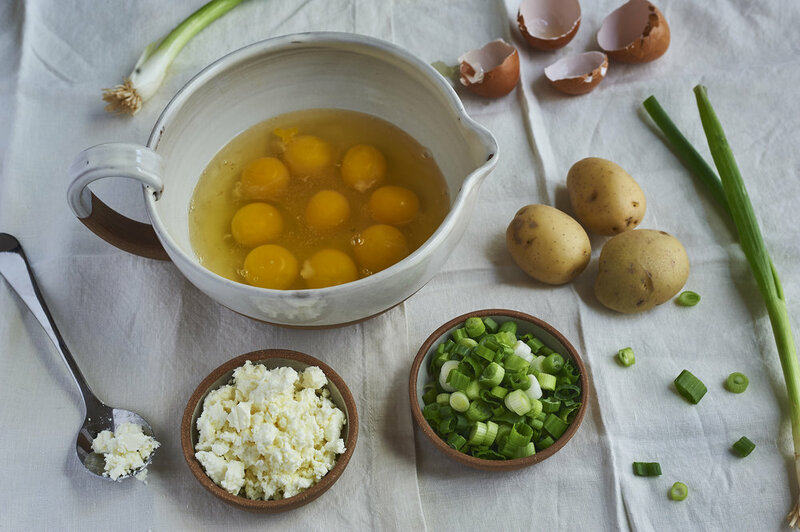 A classic combination of potatoes, onions and eggs with the delicious addition of basil and feta. A popular potluck or picnic dish because it is delicious warm as well as room temperature. 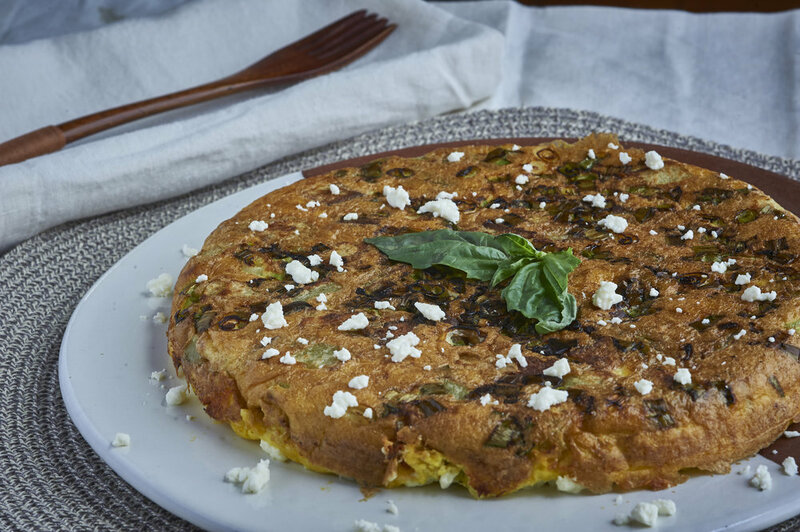 This easy tortilla recipe can be made in less than an hour and is easy to clean up. Enjoy! Pour olive oil in a large oven proof skillet over medium heat. Add potatoes in a single layer sprinkle with a couple pinches of salt. Cook about 10-12 minutes, as the oil begins to bubble watch them closely pull them ou before they start to brown. Drain them and set aside in a large bowl, reserving 3 tablespoons of the oil. Add 1 tablespoon of oil to the skillet along with the scallions and the basil, wilting slightly, add them to the potatoes. Now whisk the eggs and add them to the potato mixture, set aside. Add the remaining 2 tablespoons to the skillet over medium heat add the egg mixture. Cook about 10 minutes until the edges are almost set but the middle is still a bit wet. Add the crumbled feta and push it into the tortilla. Place in the upper two thirds of you oven about 5 minutes. Using oven mitts, place a large plate over the tortilla and flip the pan over the tortilla. It will be hard not to cut into the tortilla right away, it smells great. You can serve it at room temperature too though and it is very popular at a pot luck or picnic.